Make yourself at home in one of the 39 air-conditioned guestrooms. Complimentary wireless Internet access keeps you connected, and digital programming is available for your entertainment. Conveniences include phones, as well as safes and day beds. With a stay at Petit Palace Triball, you'll be centrally located in Madrid, steps from Gran Via Street and within a 10-minute walk of Puerta del Sol. 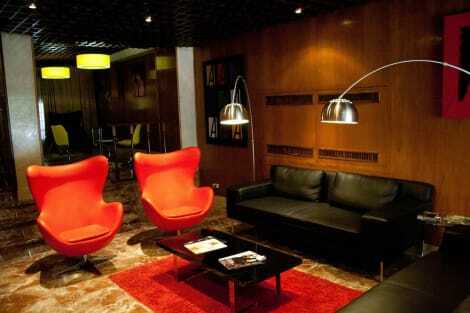 This hotel is 0.4 mi (0.6 km) from Lope de Vega Theatre and 0.4 mi (0.6 km) from Circulo de Bellas Artes. Housed in an elegant property on Madrid’s prestigious Gran Via, Hotel Madrid Gran Vía 25, managed by Meliá is located close to Puerta del Sol and a short stroll from Madrid Cathedral and the Royal Palace. Rooms are comfortably furnished and feature complimentary wi-fi access, satellite TV and en-suite bathrooms. Wake up to a delicious breakfast buffet served in the dining room with a great Gran Vía views.